There is a saying that “Cruising plans are written in sand at low tide.” Once again that has proven true for us, but this year it wasn’t our electric windlass that broke or our watermaker that needed a part the day we left on a cruise as in years’ past. The “plan” was to leave on Monday, November 30, when our slip reservation at Sunset Bay concluded. However, the weather has been rainy and windy for weeks, and it looked like the best weather window to get to Miami would start Tuesday, December 1. 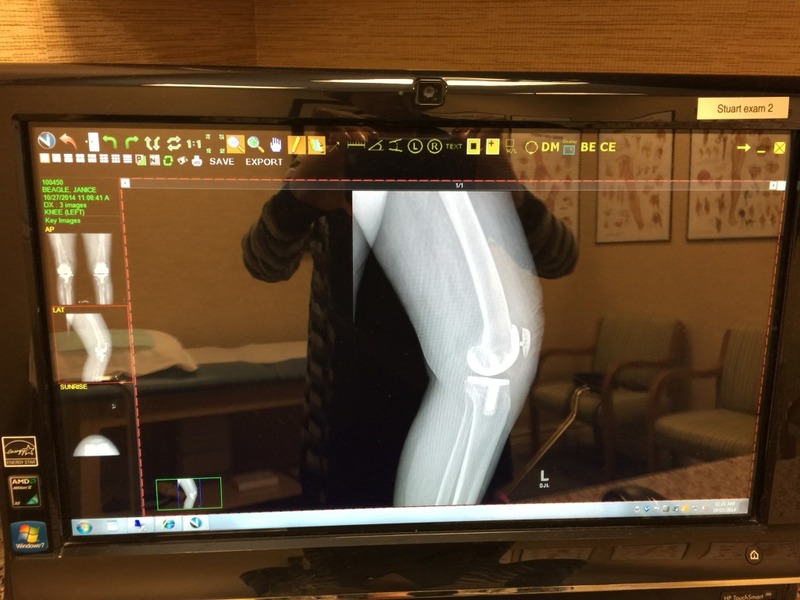 Unfortunately, Sunday night we spent four hours in the emergency room when Mark had intense pain. It was diagnosed as a prostrate infection, and he has an appointment with a urologist on Thursday. The antibiotics and pain killers they gave him in the emergency room stopped the pain but also made him very tired, keeping him from doing some last minute projects. We decided we had to stay and now the weather window is closing Friday. Also, today (Tuesday), I got a phone call with the results of a recent bone density scan. It came back with a diagnosis of osteopenia in both of my hips. Luckily someone had just canceled an appointment today and I got in to see my doctor shortly after the phone call. Now I have to get some medications to keep it from getting worse and developing into osteoporosis. We are incredibly lucky that these two health issues occurred before we were in the Bahamas where health care would not have been what we got here. We have had a very busy six months in Stuart. 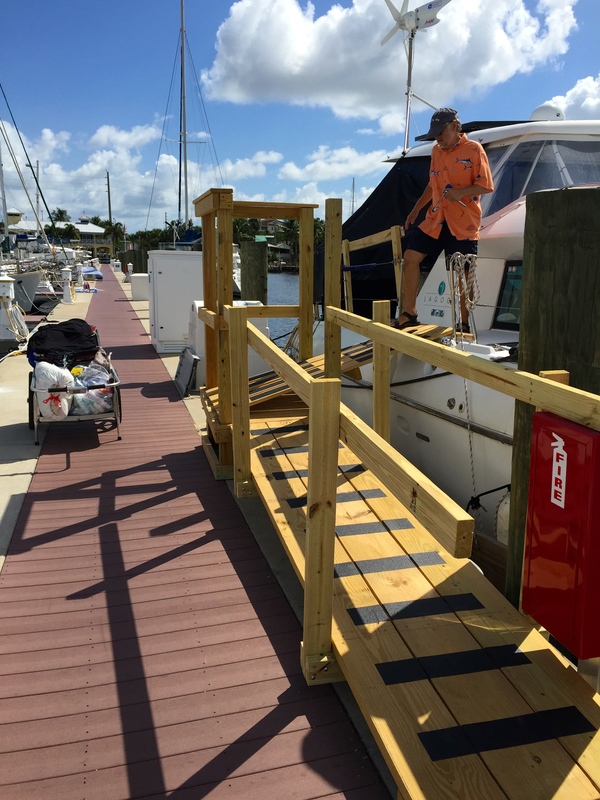 Another popular saying is, “Everything on your boat is broken, you just don’t know it yet.” Some repairs we knew we had to do, some we didn’t. This summer and fall we replaced the trampolines, which were rotting. We also knew the watermaker needed a new pump. It was no secret that our dinghy had seen better days and after having to add air everytime we used it last winter, we replaced it this fall. The radar wasn’t working and we were able to find a new unit, which has been discontinued but works with our current Raymarine navigation system so we don’t have to replace everything. We have four air conditioning units on the boat and two of them needed to be replaced. We were able to have the salon one custom built locally, for about half the price of the same one we had. We didn’t replace the one in the master cabin yet but cool air from the other cabins and a fan keeps it comfortable. Our TV stopped working several months before we returned to Florida last spring so a new one had to be purchased. Luckily we had a warranty in effect and the replacement was basically free. Even our “marriage saver” headphones died and new ones were no longer available. The new bluetooth ones were more expensive but also much better. We use these to communicate when one of us is in the cockpit and the other dropping the anchor and approaching or leaving a dock or mooring ball. Also, when Mark goes up the mast it is easier to communicate using the headsets. Since the new ones are bluetooth, we can listen to music from our phones or computer on them and even talk on the phone. 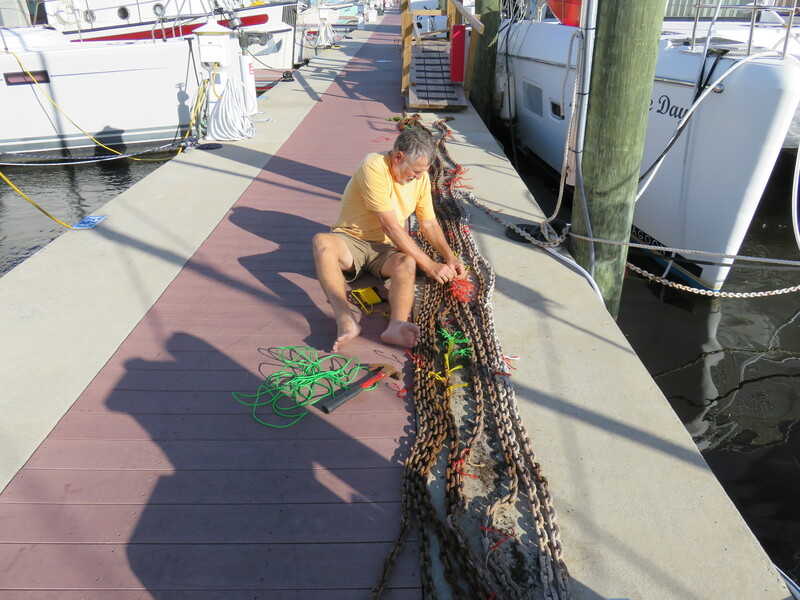 In addition there were many smaller projects, such as marking the anchor chain for depths so we know how many feet we are putting out. In fact, Mark was doing that when the pain began this past weekend. 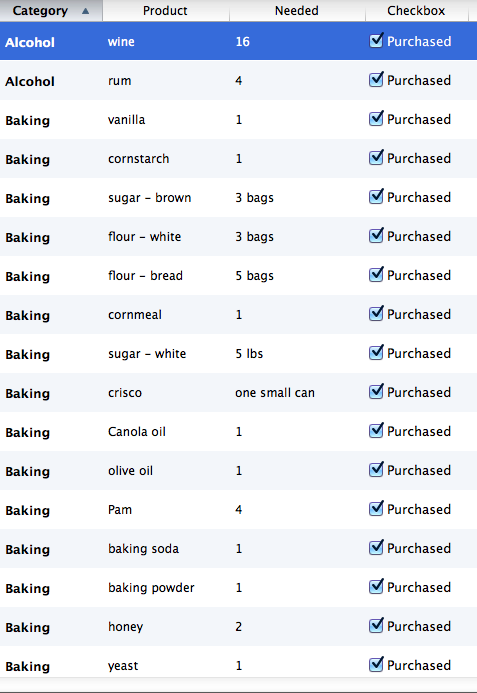 A few weeks before we are “planning” to leave, I make an inventory of the provisions we have on board. I itemize this on a spreadsheet by category and make a list of what we need for the next six months. Then, let the shopping begin! Most of the items are purchased at Sam’s Club, Target and Walmart. Apparently we haven’t spent much money at these stores this year, because after a number of multiple hundred dollar purchases, an attempt of charging over $1200 at Sam’s was refused but another try at $1000 on the Sam’s card with the rest of the purchase on another card went through. We knew we weren’t near our credit card limit so when I checked the account online, I couldn’t get to it and was prompted to call the company. That resulted in a number of questions to answer about the purchases and they even sent a text with a code I had to repeat to the agent. All was well, and I profusely thanked her for keeping a close eye on the charge card, as they obviously thought someone had stolen it. Many of our provisions are bought online and delivered to the marina. Sailor gets six months of food, medications for heartworm and flea and tick, vitamins, treats, dental chews, etc. 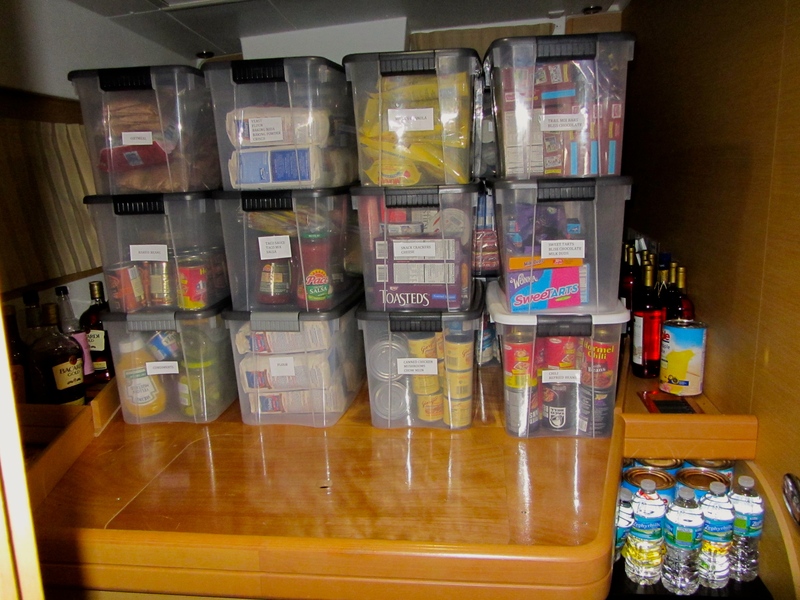 As the provisions are brought on the boat, the organizing begins. A few years ago we decided to remove the bedding and mattress from the starboard aft cabin and stack plastic boxes labeled and filled with food on the platform. Most of the paper products are stored in one of several large watertight holds on the forward deck. Also a few years ago we both got Kindles and stopped reading paperback and hardcover books. 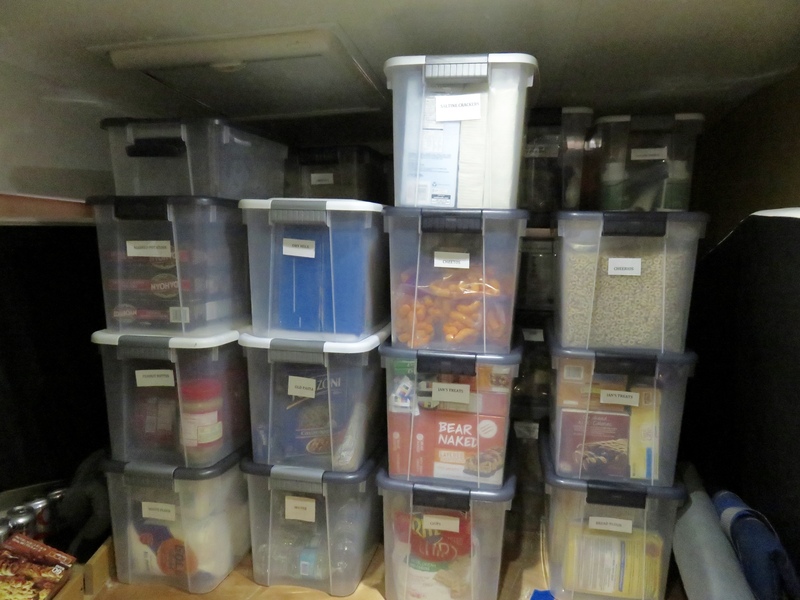 Those we were storing on the book shelves in the port companionway were given away or placed in our storage unit, and food now resides on those shelves. 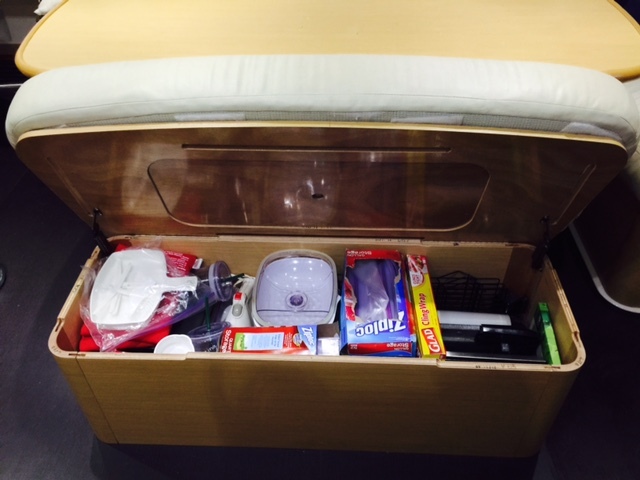 In addition, items are placed in cabinets, drawers, closets, in benches under salon cushions and under beds. To store under beds means you lift a mattress, remove a section of the platform, and put items in the storage area under the bed. Ingredients for rum punch, gin and tonic, and wine are under a bench in the salon, and a large supply of juice and pop (or soda for those of you who aren’t from the Midwest) are under a bed or tucked away on the floor. Overkill? Perhaps. Yes, people do eat in the Bahamas, but the stores are few and far between and the selection of products is limited and expensive. Some Bahamians order their food in bulk from Nassau and it comes on weekly boat deliveries. In the Exumas where we spend most of our time we can get some items in Staniel Cay at the Blue Store, the Pink Store, and Isles General. These are all in people’s houses, and if you don’t arrive at the door soon after the weekly food is delivered on a supply boat from Nassau, the pickings are meager. In Blackpoint there is another store in a house that has limited provisions. Georgetown has several stores that have fairly good supplies including the Exuma Market which is similar to a small US grocery store, but in many cases the items are quite expensive and of course the selection of products is more limited than US stores. Some food, especially dairy products, are subsidized by the government so they are reasonably priced. One could easily live on food purchased in Georgetown, but if we want our favorite brands at a discount price, Sam’s, Target and Walmart aren’t there. Snack items are very expensive. One year I craved red Tootsie Pops and Mark craved Sweet Tarts when we ran out early in the cruise. We finally found some in Spanish Wells in May just before we came back to the States. My Tootsie Pops were in a small bag where half were red and half were green and the price was about a dollar a pop, so you can guess how long they had been on the shelf. We do buy fresh fruits, vegetables and dairy products in the Bahamas, although this year we are bringing four dozen eggs from my yoga teacher and friend Kim’s free range chickens and they will last awhile since we got them so fresh. We also have a large cherry tomato plant that is full of green tomatoes already, nine strawberry plants in a strawberry planter, and quite a few leaf lettuce plants. 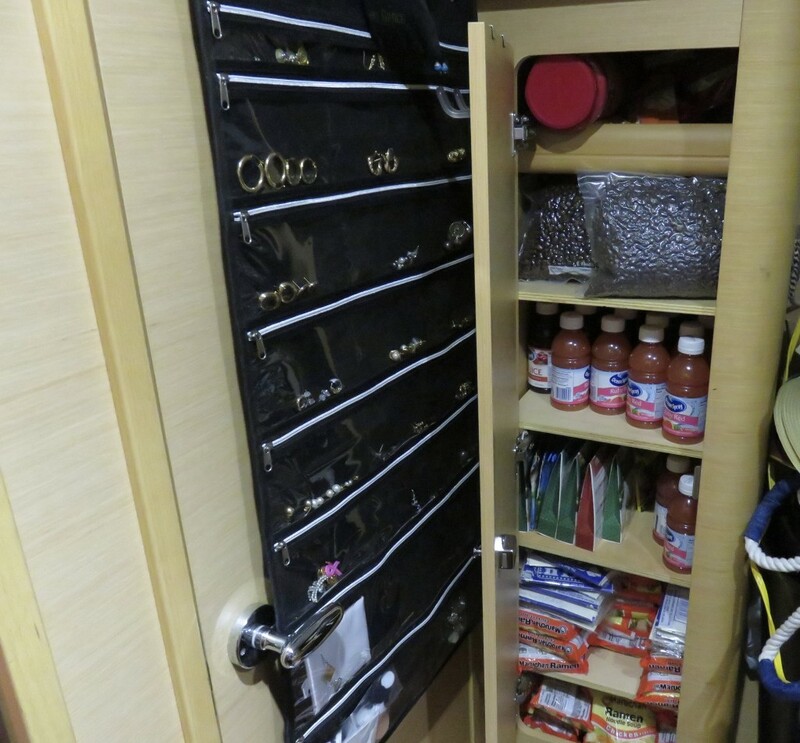 The good thing about a catamaran is there is lots of storage space. 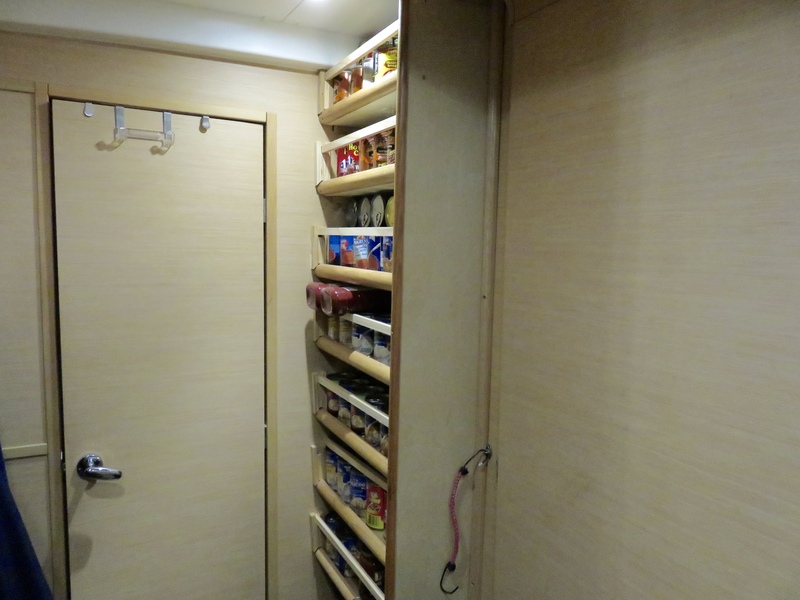 The bad thing about a catamaran is there is lots of storage space. The result is we overbuy and always come back with enough to live on for most of the summer and fall. The freezer and two refrigerators are both full now and most of the freezer items are in Food Saver bags so they will keep for many months. Below are some of the items we have stored for the next six months. The boxes on the bed are two rows deep. Right now there are 30 boxes, but I do have an additional few days for more shopping! Many of the snack foods are for sundowners where we get together with other cruisers on beaches for drinks, snacks and conversation. 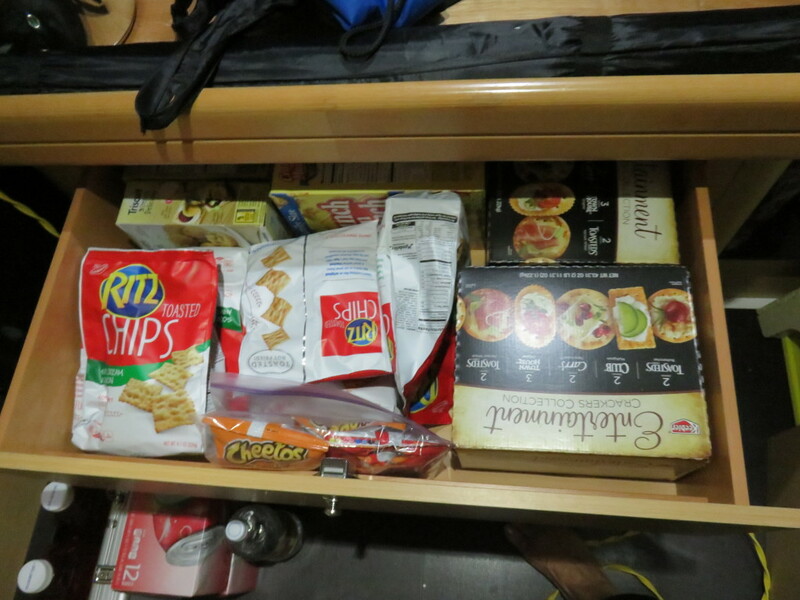 We also need snacks for the Texas Hold’em games held on Seas the Day every Saturday evening while we are in Georgetown. 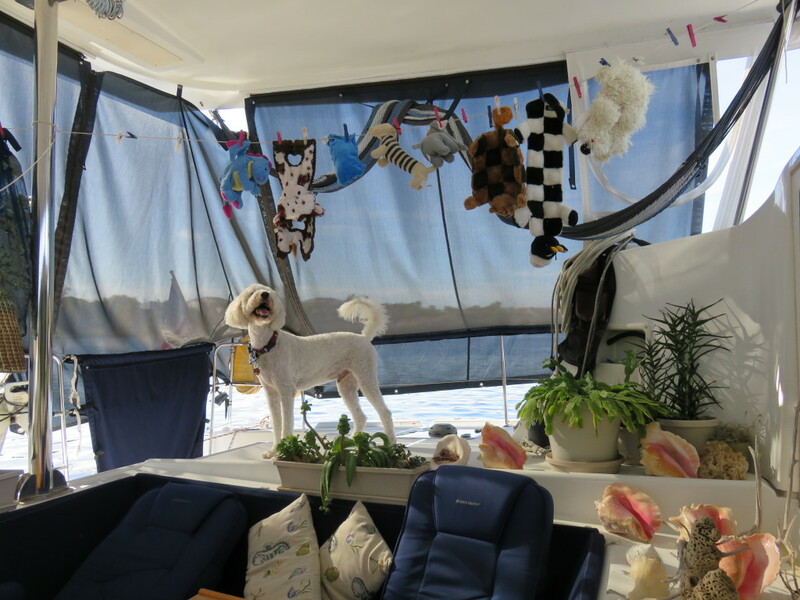 Besides boat repairs and provisioning, we have to get in all of our doctor, dentist, hair, dog grooming , veterinary, and medical test appointments before we leave. This year I also got involved in months of chiropractic care when an x-ray showed I have severe scoliosis. Last year, Mark was diagnosed with spinal stenosis shortly before we left, although it doesn’t seem to be very advanced. Sometimes trying to get this done doesn’t work, like this year I tried to schedule my yearly eye exam and my insurance wouldn’t cover it until December 1, since that’s when I had it last year when we stayed later than normal. That is today, and we were supposed to be gone so I had canceled it. There is a great deal of work and planning that goes into leaving the country on a boat for six months, especially to a third world country. 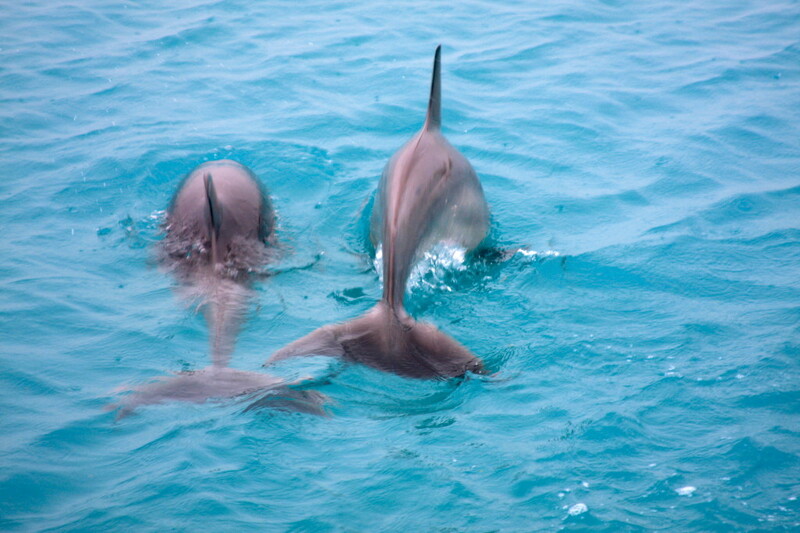 One worry has always been what would happen if one of us got sick, or even died, while in the Bahamas. This year we planned for that by getting a nautical policy from SkyMed that in the event of a serious injury or illness will fly us back to a hospital of our choice in the States by Lear Jet, even picking us up from a remote island in a helicopter, paying for our boat to be returned to our home port in Florida if we can’t return to it, flying us back to the Bahamas when we are well, paying someone to watch our dog or flying him back with us, ground transportation in an ambulance from a US airport to a hospital is included, and flying a visitor to stay with us in the hospital if needed. Physical remains are recovered and returned to the States if the worst happens. It is worth every penny for the peace of mind that if one of us was sick, injured or worse, we could get help in a US hospital quickly. We also pay for daily email, SSB and online live forecasts from marine weather forecaster Chris Parker. Another yearly expense is our SPOT device that tracks our progress when we move. In addition we pay for a mail forwarding service that scans envelopes and posts them online so we can see if we want to have the mail sent to us, shredded or the contents scanned. This is essential when we are out of the country for so long. Sailor, of course, knows something is going on. He got suspicious when he saw some of his toys being washed. A visit to the vet for an exam, shots and paperwork we bring for immigration further confirmed it. When five bags of dog food and enough snacks to cause him to drool arrived, he got dressed in his sailing clothes. 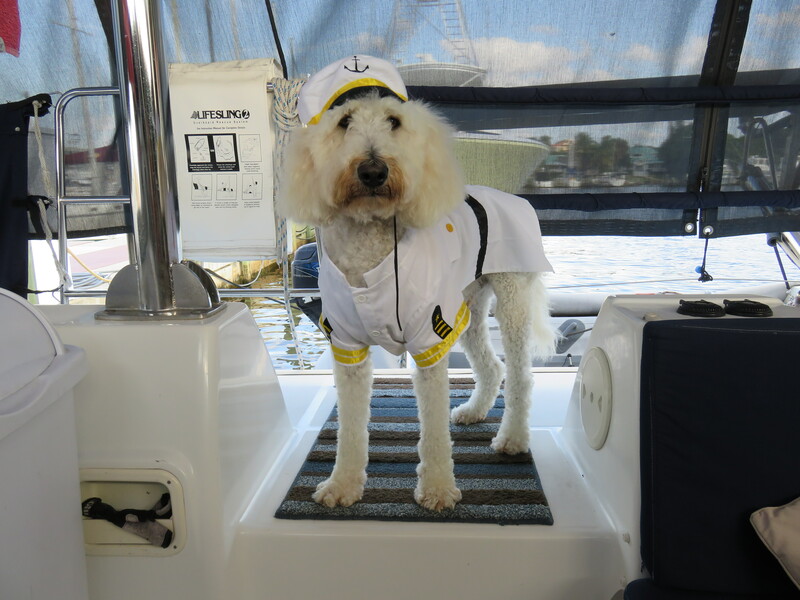 Sailor is ready to take over his responsibilities as First Mate. This is his third Bahamas cruise and as soon as we arrive, he will start running on deserted beaches and swimming in crystal clear water. While we have trained him not to bark, he does woof a few times if a stranger comes past us in an anchorage or mooring field. 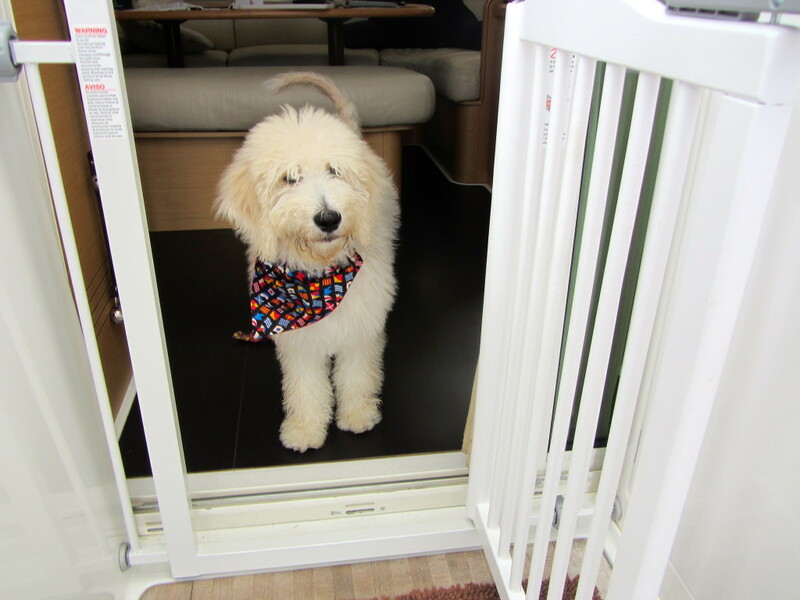 Some of our followers on this blog and on Facebook have commented that they would like to have Sailor’s life. After Mark’s appointment on Thursday, we could leave Friday morning, but the weather window closes that day, according to current forecasts. Hopefully we can leave early next week. Our cruise to Miami, where we wait to cross to Bimini in the Bahamas, takes us first to Lake Worth/Palm Beach on the ICW, then to Ft. Lauderdale on the ocean, and finally to Miami on the ocean. We need a three day window of good weather that doesn’t create big waves on the ocean before we will leave Stuart. It’s been a wonderful six months in Stuart, but we are anxious to get to the Bahamas. Each year something seems to happen just before we leave, and hopefully these medical problems were it this time. 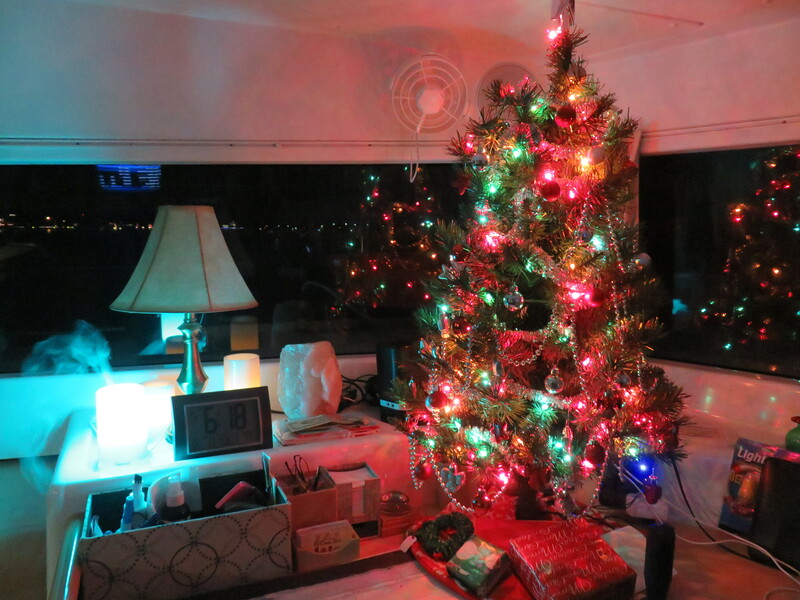 While we wait, we can enjoy having our Christmas tree lit all evening without using up the power in our batteries that our solar panels, wind generator and diesel engines give us when we are no longer plugged into shore power. In the photo below the smoke is coming from a diffuser with an essential oil called “Christmas Spirit” making our salon smell like the holidays are already here. Hopefully we’ll be opening our presents in the Bahamas. 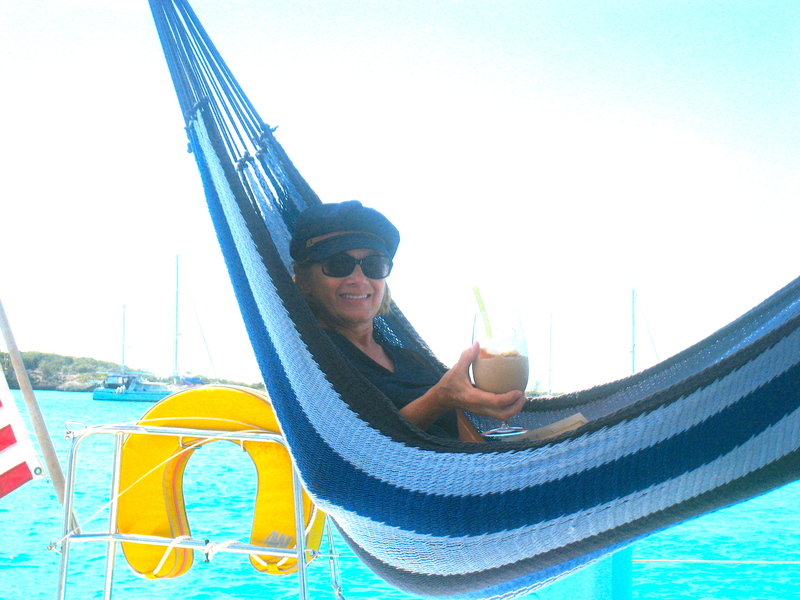 This entry was posted in 2015-2016 Bahamas Cruise, Boat Maintenance, Living on a Boat, Provisioning, Sailing, Sunset Bay Marina and tagged Boat Repairs, Holidays, Provisioning, Sunset Bay Marina, Weather, Wind on December 1, 2015 by Jan. Normally at this time of the year we would be almost done checking off lists of things we need to do before we leave for the Bahamas in November. The boat repairs would be almost done and we would be provisioned for six months. However this year due to waiting for Sailor to turn 6 months old in December we have an extra six weeks to get ready. Mark is in full repair/install mode and he is definitely making lists and checking them off. He has finished the washdown pump installation, which seemed to take longer than anything he has done on the boat, including installing the AIS, the watermaker, the Satellite TV dome, the washer/dryer, the solar panels, batteries, the wind generator, LED lights, and numerous other complicated projects. Why? Well, this installation involved running wire and hoses from one end of the boat to the other, side to side and front to back though walls not intended to have things running through them. All this so we can wash off the deck when we are not at a dock where we can connect our hoses to shore water. The hose is near the anchor, where we can use salt or fresh water to wash off the mud that always comes up with the anchor. In addition, we can connect a regular 50+ ft hose to it to wash the entire boat. In the picture below Mark is down in a locker making a hole to bring the hose out to the deck. Notice he is not smiling. Here’s the rest of his current list: build a drop leaf cockpit table (which he has just started), put a hinged seat on the salon bench so we can get into the storage under it easier, remove the glass from three corroded bathroom mirrors (each has three sections) and get new glass, install a solar hot water heater, fix the freezer, fix a leak in one water tank, install (many) new 12V outlets, install LED lights in the cockpit, install LED lights in three cabins above beds, install another (6th) battery, and install an SSB antenna. In addition we have to get the mast and sails put back on (called “stepping the mast”) and get cloth sleeves made for the foam cockpit lifeline covers. I suspect more will be added to this “fix” list in the next few weeks. In the meantime, I need to start thinking about provisioning and making those lists. We will wait to do the actual shopping in early December. Once we start buying six months worth of food, paper products, personal items, etc. 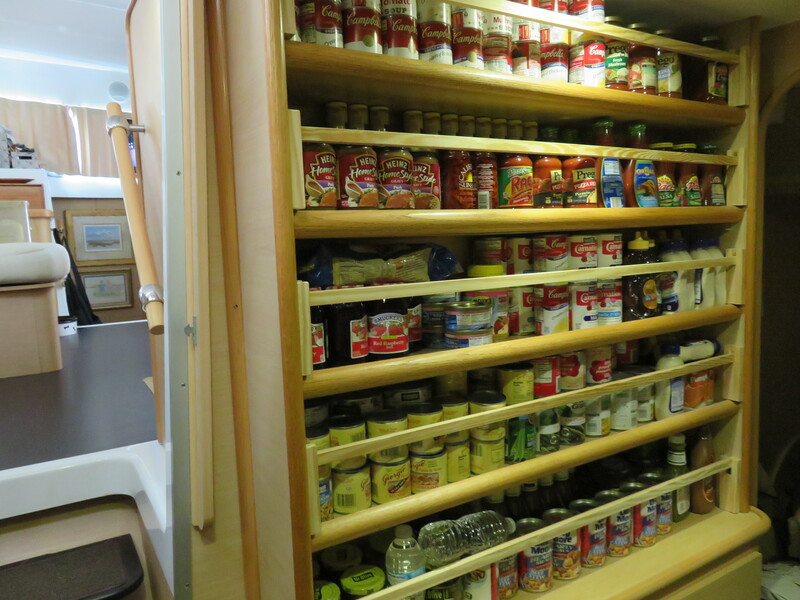 it fills a whole cabin and every storage area including the freezer and two refrigerators. 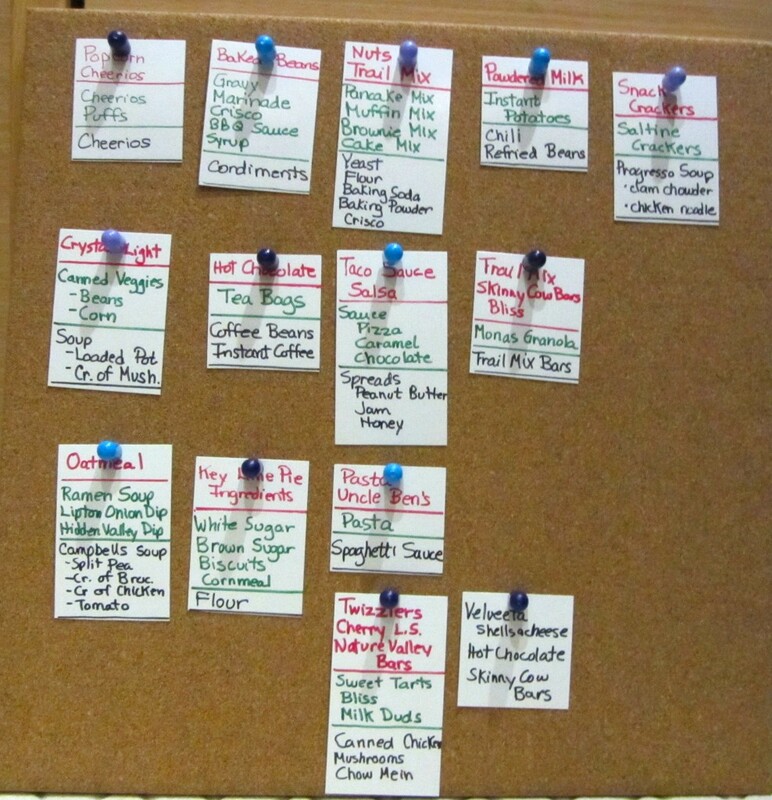 We are actually still using supplies we bought a year ago….obviously we overbought. Sadly, I must have been in a hurry last year, or maybe just lazy, but I didn’t keep an itemized data base of what we bought before we left, what we bought in the Bahamas, and what we had left at the end of the trip. We have to provision for Sailor too. I’m waiting to purchase his lifejacket until just before we leave since he is growing so fast. He is getting the Ruffwear K9 Float Coat Dog Life Jacket. We got a nifty gate that swings open both ways to put in the doorway leading to the cockpit. 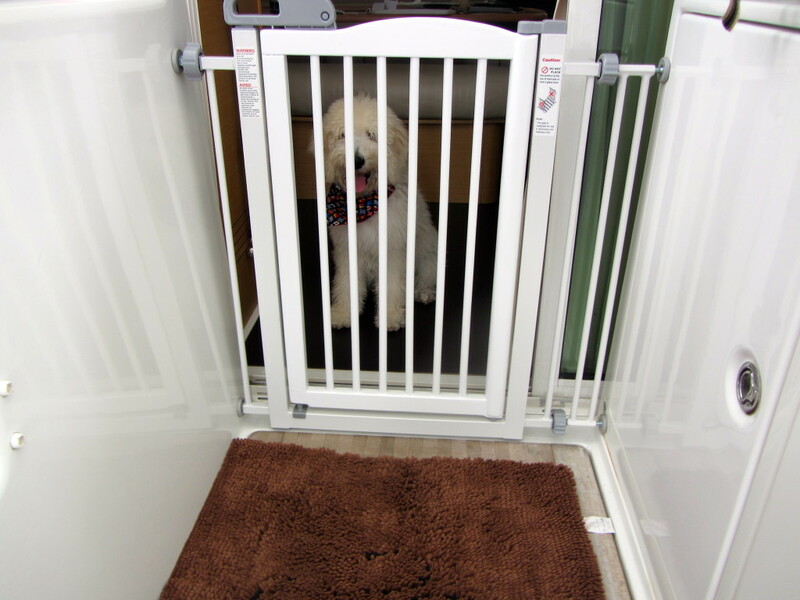 It’s called the Richell One-Touch Adjustable Pet Gate and is much nicer than baby gates that you have to step over. In the last few days, we have trusted Sailor on the deck without his leash when we are with him. The gate must be kept shut if we can’t keep an eye on him because he isn’t ready to be out there alone and won’t be for awhile. Thank goodness it is finally cool enough to turn off the air conditioning and open the door and windows/hatches. Incidentally, the brown rug by the gate is advertised to “soak up to 7X its weight in water and mud” and dry 5X faster than ordinary door mats. We’ll see how that works with a wet dog coming back from sandy beaches. It’s called a Dog Gone Smart Dirty Dog Doormat. Of course, it is vital to bring six months of dog food with us. We have been using Life’s Abundance Dog Food which we order online. They have a formula for number of cups per day for age/weight and how many cups are in each size bag, so hopefully we’ll figure out the correct number of bags to buy. We’ll also bring any medicine we think he might need. Since he will continue to grow for the second six months of his life, we have to bring larger collars and harnesses which he can grow into. We give him NuVet Plus Vitamins and of course he’ll need six months of heartworm and flea and tick medicine. Last, but probably not least, Sailor has an appointment to be neutered before we go. 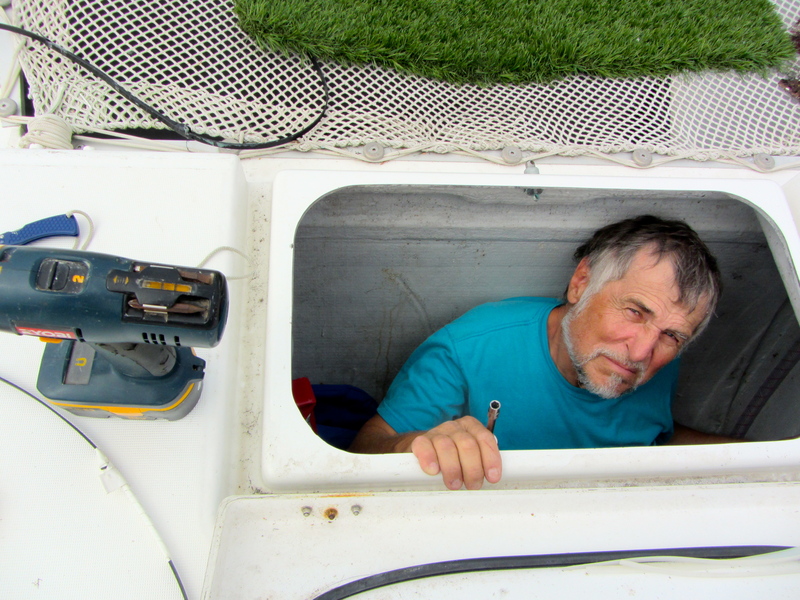 This entry was posted in Boat Dog, Boat Maintenance, Provisioning and tagged Boat Repairs, Provisioning, Washdown Pump on October 26, 2013 by Jan.